It’s now two wins in three years for Merchant Kitchen chef Jesse Friesen. Having taken gold at the 2016 Winnipeg Gold Medal Plates representing Pizzeria Gusto (both Gusto and Merchant are owned by Bobby Mottola), Friesen added to his collection last night at the Winnipeg leg of Canada's Great Kitchen Party winning gold with a dish of wild boar and lobster terrine, which was buttressed with some dazzling elements that included a pickled onion jelly, a rutabaga and horseradish purée, ricotta gnudi, king oyster mushroom, and a sauce of lobster bisque infused with squid ink. The dish was paired with Blue Mountain Brut. Silver went to Heiko Duehrsen of the Assiniboine Park Conservancy, who also added to his silverware collection, having won bronze last year. Duehrsen’s dish featured butter poached lobster, a garam masala sabayon, disks of cauliflower, saffron and coconut milk, and a carrot vinaigrette that was this judge’s favourite component he ate all evening. The dish was paired with a 2016 Cave Spring Riesling. Bronze went to Thomas Stuart of Thermëa by Nordik Spa Nature, who presented a lovely version of smørrebrød featuring butter poached walleye – which lent the fish a nice firm texture, almost like lobster or monkfish – that was surrounded by dots of two different kinds of fluid gels, one composed of elderflower and white wine, the other of bergamot orange and hibiscus. 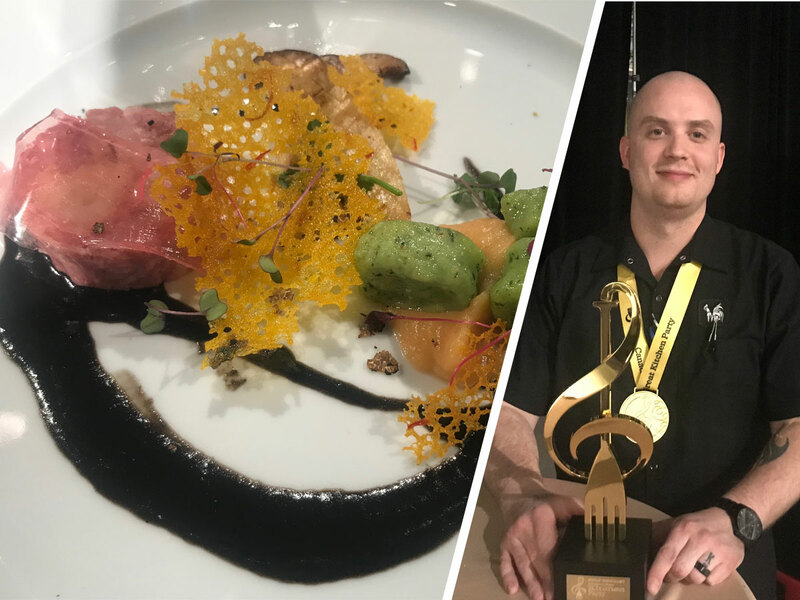 The other chefs in competition were Jacqueline Hildebrand of Hy’s Steakhouse – who just missed out on the podium with a duck dumpling, Wayne Martin of Capital Grill Bar and Grill, and Tim Palmer of VG @ Fairmont Winnipeg. Friesen will now go on to represent Winnipeg at the Canadian Culinary Championships in Kelowna from February 1 to 2, competing against chefs who won Canada’s Great Kitchen Party events in Calgary, Edmonton, Halifax, Moncton, Ottawa, Toronto, Regina, Saskatoon, St. John’s and Victoria. For a full report on last night’s event check out national head judge and culinary advisor James Chatto’s article here.